My favorite outfit for adult male sims. This is a full-body outfit for adult males. 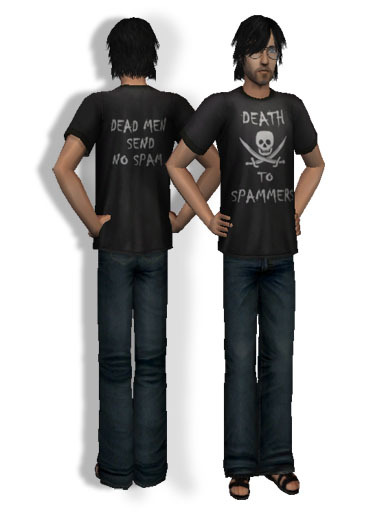 Unzip the file 'psam_death_to_spammers.zip' and save the .package file in your SavedSims or Downloads folder. Got a sim who's fed up with eternal vigilance and ready to become an active vigilante in the battle against the slimey evil inhuman sleazebag sociopaths who are attempting to destroy the net? Now he can spread the word across the land! It's time to get out the torches and the pitchforks! Immanentize the real solution to this pervasive pestilence! Hunt 'em down and kill 'em! When international television carries images of a few spammers' heads mounted on spikes, they'll stop! And if they don't, no worries, we can make more spikes! How many o' them can we make die? Oops... whew... got a little carried away there. This outfit was inspired by the discussion in the topic When Spammers Attack on the Hullabaloo. Now, where did I put my pitchfork? Last edited by Greg : 03-12-2007 at 03:51 AM. Reason: Updated image location and added original nutty text. I dunno. I posted a question on the vBulletin.com help board and searched all over the web for a solution to the image conundrum. No luck yet. So I just asked over at Insimenator.net with hopes that someone can reveal the solution to the Mystery of Attached Images. Added: I just looked at the source code for this page, and compared it to the source code for the "Codi Jo" download page on Insim. There is a difference between the way Insim's vBulletin interprets the [img] bbcode and the way this version of vBulletin does it. The HTML generated by this version outputs an anchor tag even though the bbcode is [img], while Insim's generates an image tag. Last edited by Greg : 03-09-2007 at 06:22 PM. The hot tub image I attached worked ok... Is the problem with links outside the BBS system? The problem is that the full-size images don't show in the message. I've learned that to make that work, I would have to enable dynamic URL's in IMG tags. That's not a good idea because it opens the board to malicious exploits, so I think we'll have to rely on photobucket for image hosting, at least for now. Oooo... DAZ Studio makes really pretty stuff! Hahaha this is perfect for one of my story characters! I'm glad you like it, Axa! And welcome to Sun Sims!